With log country appeal and architecture, covered bridges, natural pond, water fountains, walk way bridges, fully stocked mountain trout spring to moonlit mountain view, Smoke Hole Resort stands up to a memorable and lasting lifetime of you and your new spouse’s untangled love. Let us sweep you off your feet to an event that is custom tailored to your desires, so that each perfect moment of your day will be distinctly, and undeniably yours. 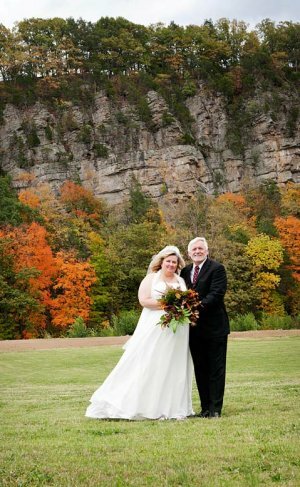 And it's all surrounded by the beauty of Smoke Hole Resort, where our Honeymoon Cabins have a heart shaped Jacuzzi and luxurious accommodations to give your marriage a lasting foundation for the memories of a lifetime. Wedding ceremonies on our lawns with a spectacular rock trimmed mountain view adjacent to a natural flowing spring and our pond with lighted fountain. Let Smoke Hole Resort cater your wedding reception! Don't have the time to plan a wedding? Call for information on our Elopement Packages where we plan it all, starting at $1200. Get the groom and a dress and we handle the rest! Thank you for your interest in having Smoke Hole Resort host your special occasion. Fill out this form to request information or a price quote. Bold items are required.